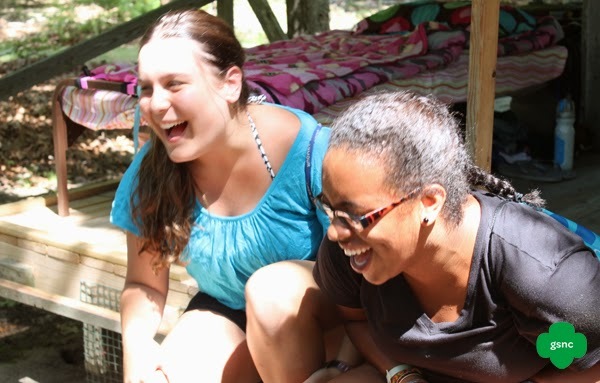 5 Signs that Girl Scouts are at Girl Scout Camp! 1. Painted rocks welcoming Girl Scouts, old and new! 2. 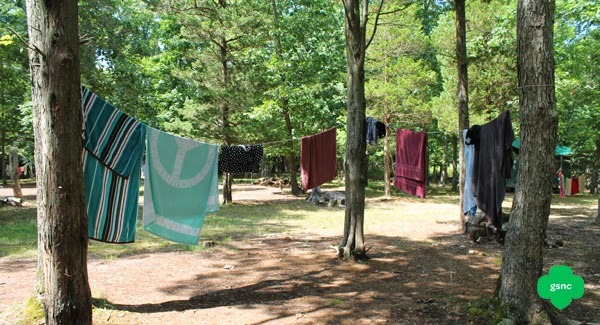 Wet towels from the beach hanging out to dry on the clothes line! 3. 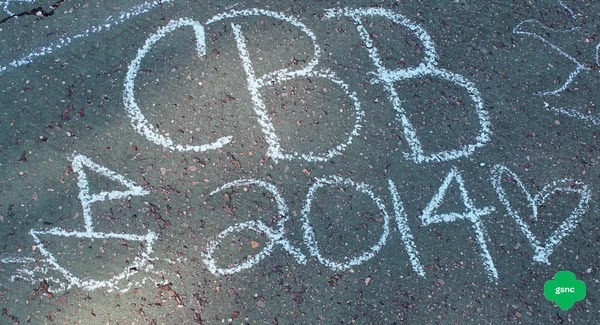 Chalk drawings of everything from flowers and boats to expressions of love for camp on the basketball courts! 4. Rocks strategically placed in the sand to spell out "CBB"! 5. Finally, the one that your can't see, but you will hear... the sounds of girls giggling and singing unit songs when you don't actually see anyone around! What is the Difference Between a Gold Award Mentor and Project Advisor? Here is the scenario…You are working on your Girl Scout Gold Award. Council has assigned you a Gold Award Mentor, but at the same time, they are telling saying you need to find a project advisor. You are sitting there wondering to yourself, "what is the difference between the two?" You’ve figured out the issue you’re going to address with your project. Now it’s time to find an expert to help along the way and give you advice and suggestions. This is a person from your community who is knowledgeable in the topic area of your issue, so you can ask questions and brainstorm ideas together. The only people that cannot be your Project Advisor are your GS Leaders or family members. Once you researched and found someone that you think can help you, reach out to them in an e-mail, a letter , or in person. Explain that you are earning the Highest Award in Girl Scouts- the Gold Award. Include the issue you want to address and ask if they are willing to assist you. Most people are excited to help Girl Scouts earn their Gold Award. The Project Advisor will need to sign your Gold Award Proposal. Don’t forget to thank them and exchange the best way to stay in contact. At your Gold Award interview you will be assigned a Gold Award Mentor from GSNC. All mentors are volunteers who give their time to help girls succeed. She will be the person you can reach out to for advice on money earning, flyer approval, and any questions on process, or any bumps in the road. She will be there to cheer you on. It’s extremely important that you stay in contact with your Gold Award Mentor a few times a month to keep her updated on your progress because she will be the one to approve your project when it is completed. It is the girl’s responsibility to contact her Mentor; if there is no contact, the project will NOT be approved. If you some reason you cannot reach your Mentor, you must let GSNC know. Did you know that July is National Ice Cream Month? And July 20th was National Ice Cream Day! In 1984, President Ronald Reagan proclaimed that the third Sunday in July would be celebrated as National Ice Cream Day. 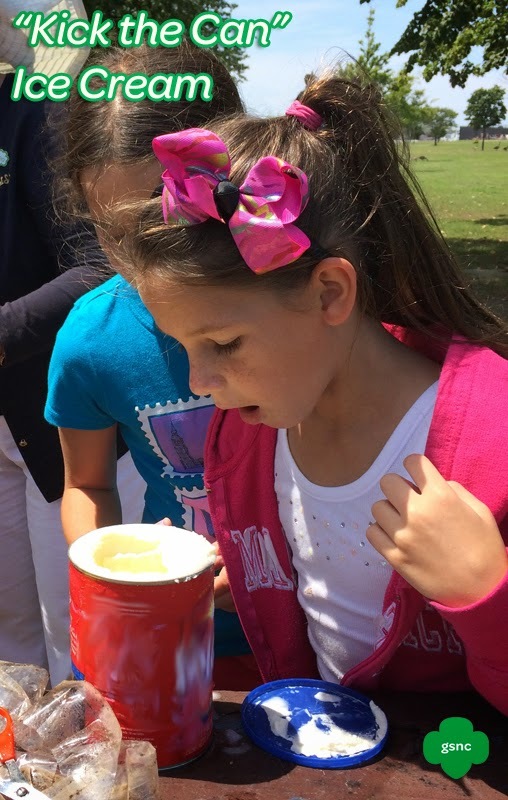 A non-traditional way for Girl Scouts to celebrate National Ice Cream Month is to get together with your Girl Scout Troop to make “Kick the Can” Ice Cream. After mixing the ingredients and “kicking the can”… yes, just like the game…the end result is delicious, soft-serve style ice cream which sure is a tasty treat. Here are the directions for “Kick the Can” Ice Cream, which we found in The Junior Girl’s Guide to Girl Scouting and on GSUSA’s Recipe Section of their website. 1. Place all the ingredients (don't put the salt or ice into this mixture) into the small, clean coffee can. Seal the lid in place and duct tape it on. Now that the ingredients are secured in the small coffee tin, give the tin a couple of shakes to make sure the ingredients are all mixed together. 2. Once the ingredients are all mixed together, place the smaller coffee can into the larger one. Fill the space around the small can with ice and salt in alternating layers… make sure you get a good amount of salt in there with the ice to make the ice stay colder longer. Place the lid on the large can and seal it tightly with the duct tape. 3. Roll or shake the can for about 30 minutes. About 15 minutes in, you will want to open the cans up and check the ice cream (if there is ice cream sticking to the edges, scrape it off with a spoon or spatula) and add more ice and salt to the larger, outside can. 4. Once the ice cream has reached the consistency you want, get a spoon and enjoy your creation. YUMMM! How many times have you asked girl in your Troop, “What would you like to do this year?” and they say “I don’t know”? Or you ask them “How are you feeling,” and you get the standard “I’m Fine”? As a Girl Scout Troop Leader, these responses can be frustrating. You want your Girl Scouts to do activities that they will love and enjoy and you want them to let you know if they are excited or looking forward to an activity or if they disliked an activity all together. What are some ways to we can work towards getting more expressive answers? Try working with your girls on finding their words… In her interview “How to Increase Emotional Intelligence,” Rachel Simmons suggests that we teach girls an emotional vocabulary with words like “excited,” “frustrated,” “encouraged,” “concerned,” “disappointed,” “lonely,” etc. Encourage girls to keep a diary, through writing or pictures, of their feelings each day. Help them figure out which feelings words might be the best to describe their writing or picture entry. In the Be My Best Self Badge for Brownies, girls keep a record of their feelings for an entire week. For older girls, you might even want to teach them how to use I-Statements, which can be found in the Cadette aMAZE Journey book, to express their feelings to others. Want to try something else with your girls? Play mix ‘n match with feelings words and the Girl Scout Law. Write each feeling and each line of the law on a separate index card and put the feelings cards in one pile, the Law cards in another. Have each girl pick 1 card from each deck. Think about ways the feeling connects to the line of the Law. For example, if a girl pulled the “anxious” card, and she also chose “Courageous and Strong,” she might say that she is courageous and strong if she overcomes anxiety about standing up to a friend. By working with girls and encouraging them to express their true feelings, we are helping build the leaders of tomorrow. 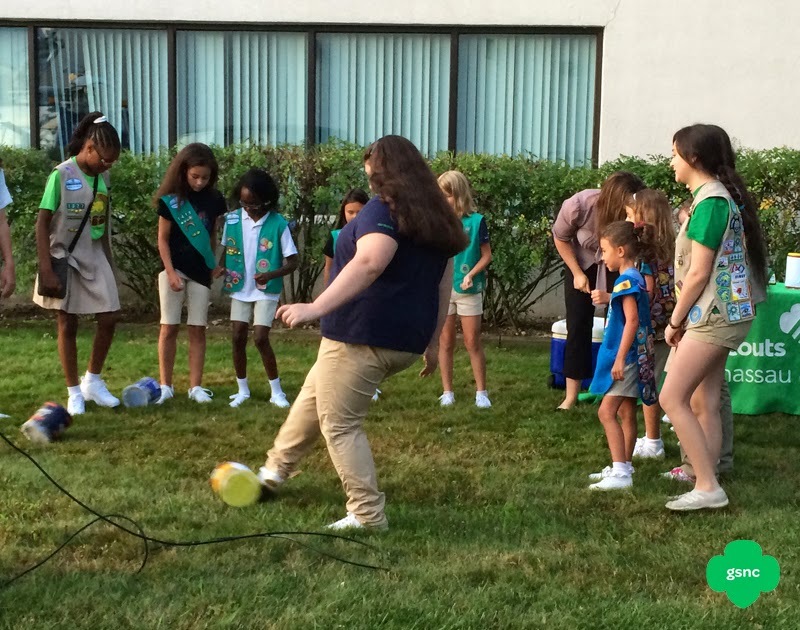 Summer doesn’t have to mean the end of Girl Scouting. Now is the time to get the girls in your Troop together to do some of those activities that require a little more time and a lot warmer weather. Kayaking, Troop Camping, Ice Cream Parties, Planting Trees and so much more… there are so many fun adventures and exciting memories to make. If you’re looking for someplace to start, try some of GSNC’s Summer Season Patch Programs. (a) Participate in two summer activities…. It can be any summer inspired activity that your Troop wishes to do from a picnic to a hike or even a trip to the water park. (b) Complete one service project… If you’re looking for some ideas, try a beach clean-up, planting a tree or collecting some school supplies for Astoria Bank’s Kids Tools for School Drive. (c) Start regular meetings before the end of October… and don’t forget to re-register your Girl Scout Troop. Every girl can make a difference this summer! We’re challenging you to perform community service All you need to do is tell us what kind of community service you performed and keep track of it. Simply print a copy of the GSNC Summer Service Challenge Log and fill it in every time you take part in a community service activity. At the end of the summer, return the log to the GSNC Shop. Let’s see how many hours Girl Scouts of Nassau County can get towards the Summer Service Challenge. We want to beat 1470 hours! Can We Do it? Happy Independence Day (or Happy 4th of July)! On July 4, 1776, the thirteen colonies declared their independence from Britain by adopting the Declaration of Independence. Today is a day to celebrate our history, our freedoms and democracy. We highly encourage you to add a reading of the Declaration to your holiday festivities! 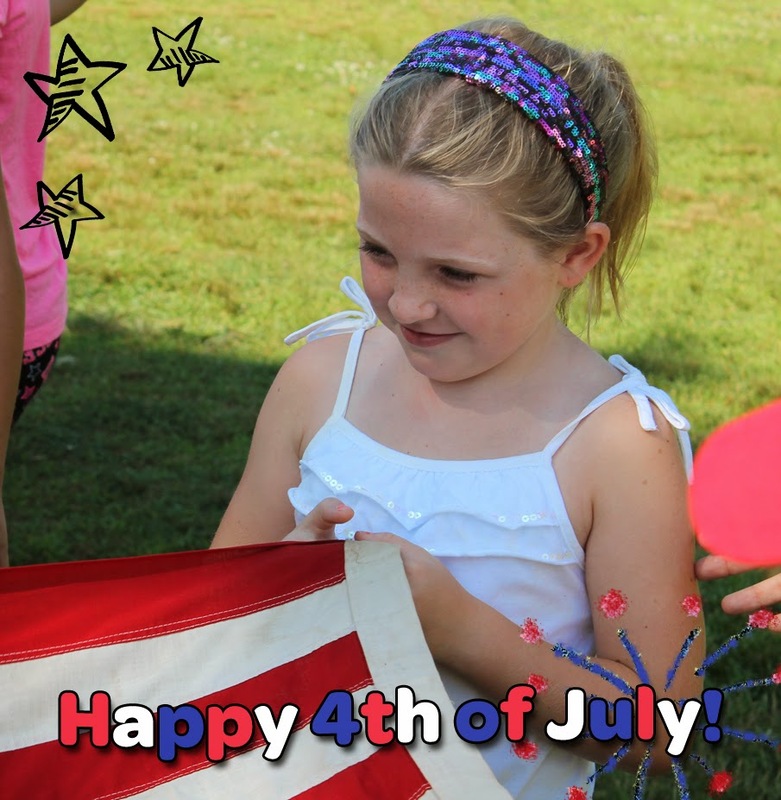 To celebrate Independence Day, bring your Girl Scout Troop together to learn a little about the history of and to honor America’s birthday. Fourth of July is often associated with BBQ’s making it a great day to work on some of those cooking badges. Brownies can work on the Snacks badge by making snacks as the appetizers, while Juniors can work towards earning the Simple Meals badge and Cadettes can turn this Fourth of July BBQ into a tour of different dishes made in the USA since 1776 while earning their New Cuisines badge. What Makes a Take Action Project Sustainable? For me, one of the toughest parts of the Girl Scout Gold Award…second to coming up with a project idea…is sustainability. The word “sustainability” is something you often hear in connection to Girl Scout Take Action Projects. What exactly does this mean? In terms of a Girl Scout Take Action Project, SUSTAINABILITY means that the project MEETS THE NEEDS of the people and/or the environment NOW, while having a plan AND the potential to CONTINUE indefinitely IN THE FUTURE. Sustainability allows for a greater, longer impact on the community. There is a difference between a sustainable project and one that is community service. Collections, drives, donations, visitations (no matter how many times done) are a onetime fix and considered community service. Beautification and renovation projects without an educational component are considered community service. Planning for a project to continue on its own or through the efforts of others (known as a grass roots project). Examples: School clubs, Library partnerships. You may also want to partner with other community organizations for help with resources, knowledge and a means for project continuation. Remember, your goal should be to partner with a group that will carry on your project long after your involvement. Educating others whereby the gained knowledge has an impact. The knowledge can continue to be spread by paper, word of mouth, web, etc. The knowledge leads to a continued impact in the environment and/or community by actions of people. This type of sustainable project needs to have a way to measure results and should reach a large number of people. Example: Pre and Post surveys. Some ways to reach a large audience may be through letters to the editor, feature stories in local media and social media campaigns. Sustainability through Advocacy. Aim to create a systemic change to current policies, practices or laws. These changes may result from widespread community education, partnerships with community leaders or elected officials who have the authority to implement change. Example: Partnering with school officials to change a policy involving the school practices, curriculum or treatment of students. Labels: Girl Scout Gold Award, Girl Scout Take Action Project, Sustainability, Sustainable Project, Take Action Project, What Makes a Take Action Project Sustainable?